"We ALL are equally guilty (Is. 53:6). But our response to our guilt is individual, and that is what determines our revelation of Christ." Booklet 5 of 6 in the Hearing God series. Those who belong to God and are called to abide in His intimacy will leave these pages with a clear understanding of what is required and to whom the call is given. Your spirit is your inner room. But you, when you pray, go into your inner room, close your door and pray to your Father who is in secret, and your Father who sees what is done in secret will reward you. The words contained in The Inner Room call out the error so touted as truth: that you can serve and worship God with your degenerate soul. And more importantly, it is an invitation to enter into your rightful place, in the very Presence of our Abba Father. Martha has undertaken the masterful task of hearing the Spirit who has laid out so skillfully in these pages the plan of God to bring us to a greater intimacy than was known in Eden. She reveals succinctly His design from the temple in Jerusalem to Jesus’ announcement that a greater Temple was imminent. God doesn’t just tell us; He shows us! He built on earth a picture of substance: the first temple. 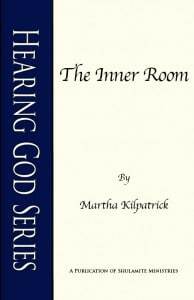 Painstakingly, He revealed the spiritual reality of His plans and Martha capsulizes His design in an easy-to-understand road map. You will be in no doubt of the passionate pursuit our Father has laid out so that we might enter in. Those who are His and called to abide in such intimacy will leave these pages with a clear understanding of what is required and to Whom it is given. You will be in no doubt of the passionate pursuit our Father has laid out so that we might enter in. The Inner Room is now available in both print and digital format. Kindle books are not just for Kindles, Download the app and read it on your preferred device. The Greek meaning is “Any private room where you cannot be easily seen.” Yes, how wonderful it is when we have our private prayer room. But there is another room to which this verse points, a room deep inside the born again believer. A room always with you, a hidden world overflowing with God. Inner Room, the place of your fresh born spirit. In the beginning of His public ministry, Jesus walked through the temple and saw the marketplace it had become. This was Christ’s only act of violence and He repeated it again at the end of His life, going the second time to cleanse the temple of the “robbers’ den” (Mt. 21:13). The disciples could see this was Psalm 69:9 – “Zeal for Your house will consume me.” What is zeal? It is the fire of intense love. The word means “to be hot, to seethe—boil of liquids, glow of solids.” Here is the greatest passion of Christ’s life: for the Father’s purpose and that is to have a place so holy that He can come down to earth and dwell with His created humanity. This startling picture is Christ’s violence against the soul using God for profit, Christ’s passion for a House of worship for His Father. His whole life, from beginning to end, was to build a House for the pure and true worship of His Heavenly Father. The ‘old man’ has no place in Christ. No welcome, no resting place. The fallen soul in its self-worship will be cast out and repudiated. Flesh is the enemy of God under sentence of death…and we need to see it. By the power of the Cross in your life, Christ casts out of His temple, the selfish flesh in me. And you. Still today the temple is desecrated by God business and still to this day, a little of God, a lot of self and the Lord will drive you out. The Jews, outraged, demanded that He prove His authority. Jesus was bringing in an entirely new Place of Worship: Himself! Here, then, Jesus dismisses the temple in Jerusalem, with all its history, its tradition, its ritual, its priesthood, its material glory, and, so dismissing it, puts Himself in its place for ever. What an immense “Significance” is embodied in this change! His body was destroyed by men, religious men, representing the destruction of that earthly temple, in which destroying of His body the doom of the earthly was sealed, and the historic system shattered and scattered. In its place a resurrection body, Christ risen, becomes the Temple forevermore. All that was typified by the temple in Jerusalem is taken up in the risen Person – Jesus Christ; a spiritual House of God; a spiritual “My Father’s House” (The Transcendent “Sign,” Witness and Testimony Magazine, Jan-Feb 1966, Vol 44-1). The soul is the seat of personality, of will and thought, of emotion and individual identity. In Eden the spirit of humanity died ‘on the day they ate of the tree of knowledge’ (Genesis 2:17). The soul did not die, it rose by satanic ambition to ascendency, to take the place of God and judge Him. The soul goes by several names: flesh, old self, sinful nature. The mutiny of the soul is to live in independence, to know apart from God. The most insidious delusion buried in every sinful soul: the old self believes it IS god. The flesh, the ‘old man’ became the pawn of Satan. Adam and Eve gave the enemy access to the thought life of the human soul. Now through suggestions to the mind of the fallen-soul, the enemy prods the emotions of the flesh so that he can overtake the body with sin…and death. The flesh soul is a sin nature, not merely acts or deeds. Flesh is the corrupted nature of humanity. And it is not salvageable, not redeemable. The fallen soul, being the ground of Satan’s influence, cannot meet with God, cannot access or please Him. This unsolvable soul has been solved. The entire soul-sin nature was destroyed on the Cross. He is the brilliant, perfect Helper who will guide you to find and live by your new spirit. He is sent for this purpose. Then you will live in and from your own Inner Room where God is in you and you are in Him. All that I have written about the Temple and the soul are for understanding soul and spirit, to know what true worship is. It is for vision, to see what God is building and how He forms the living stones we are. Enjoy the scene. To study or memorize it as your solution really isn’t necessary. The whole thing is too much for me. I won’t remember it all. I can’t make it happen. I can’t see the flesh so I can’t get rid of the flesh. I don’t always know if I am in my spirit. Sometimes I realize it only later, that I was in God’s glory. I don’t have to fear. I only have to follow. I don’t have to know. I only have to listen. To be led of the Spirit, THAT is necessary. He is not only your personal Helper, He is your Guarantee! He will see to it that you and I make it to the end—to the fulfillment of God’s desire and promise. God guarantees it! The Holy Spirit comes directly from God for me. He knows me far more than I can imagine and He has my destiny in His all-knowing Hands. He keeps me, He corrects me, He watches me. And even more wonderful, through the Spirit, Christ enables me because He dwells in me. He seeks you. He pursues me! He wants us… How blessed we are to be sought! The Holy Spirit is our only hope. There is no other provision for you because He is the perfect solution.